Again, the domains outlined in the present form only a tiny portion of the total volume of web addresses used to propagate scareware. Our goal is channeled to expose a set of domains that can be used for research purposes, blocking them or just know what the threats of this kind that have emerged (or reemerged) in recent days. 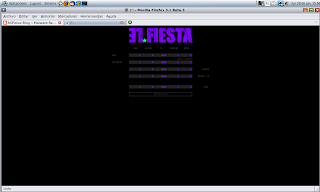 ElFiesta is another member of the family of web applications, created by Russian developer and made available to cyber-criminals, who can't only monitor and manage each of the infected computers as part of its network (zombies), but also execute attacks via the web through various techniques that involve the exploitation of vulnerabilities. One of the modules has ElFiesta precisely target the spread/infection via PDF (Portable Document Format) looking for vulnerabilities in some versions of Adobe Acrobat Reader. In this case, the downloaded file is called 4573.pdf (MD5: b7b7d52a205e950adf4795c14c7f7178), whose name is random, has a detection rate of almost 50%, thus a very important infection rate at the moment. Another focuses ElFiesta modules incorporating a method of attack scripting subject to an obfuscation technique. 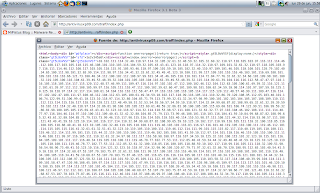 Making a deeper analysis of the case, we found a newly implemented version ElFiesta. In the following screen shows that the statistical information corresponds to our data. These methods are common to most of crimeware applications of this style, but we appreciate a more interesting detail: the domain used is a known scareware called XP Police Antivirus. Consequently, the first question that comes to mind is: XP Police Antivirus working with the recruitment ElFiesta zombie? 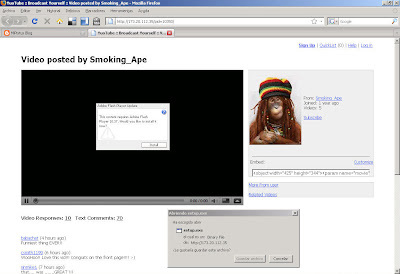 Koobface is a worm designed to exploit the user profiles of popular social networks like MySpace and FaceBook in order to obtain sensitive and confidential information of their victims, although the latest versions limiting their goal FaceBook. In fact, the word Koobface is a transposition of the word Facebook. His early versions date back to late 2008 and since then continues In-the-Wild with an infection rate of concern. Thus, the same company released a series of preventive measures to minimize the potential risk of infection, which is constantly latent for users who use the social network. In principle, the usual means of dissemination used Koobface is via web through visual Social Engineering and is the first facet of propagation. The second facet (infection) channeled their malicious actions in a very common at present, based on a combination of malware, creating a symbiosis where each component of ambient display instructions to seek a common objective and comprehensive. The trojan TrojanDownloader.Small.OCS has a detection rate of 35/40 (87.5%) creates keys in the registry and backs himself. Tinxy.AF, another trojan, it also creates files in the system and has a detection rate of slightly less than the previous 30/40 (75.00%). The trojan Tinxy.AD has a detection rate of 35/40, was detected by approximately 87.50% of the virus. Creates a copy of itself and makes use of the tool to enable a NetShell DLL, open ports, and specify a proxy. BHO.NOE is another of the trojans as part of the process of infection Koobface, with a detection rate of 92.11% (35/38), create a folder and a file. As to PSW.LdPinch.NEL trojan, detected by 34 antivirus of 40 (85.00%), is designed to steal passwords from different web browsers, mail clients, IM clients and other services. Finally, download a variant of the family, the worm Koobface.NBH, in this case, the detection rate was 27/40 (approx. 67.50%). As we can see, the infection of this malware isn't just limited to malicious instructions they have, but it goes beyond that and download another. This action is a common behavior in the present, where the fusion of Web applications and control of botnets and the administration of different types of malware, joining forces with a common goal: improving the economics of crime.